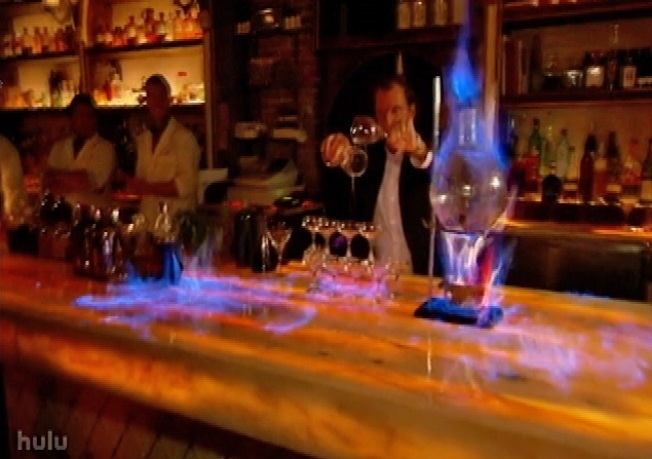 A shot of the Apotheke's fire show, as featured on "The Real Housewives of New York." It's lights out for the flaming liquor shows for which Apotheke bar in Chinatown is famous; fire marshals arrested bartender Albert Trummer early Sunday after he poured various liquors across the top of the bar and lit them on fire, an event referred to as "The Show" by the bar and its patrons. Fire inspectors of the fire prevention bureau were at the bar that night and witnessing the fire, which was reportedly 6 feet long and 2 to 3 feet tall, they immediately arrested Trummer on charges of reckless endangerment and criminal nuisance, Fire Department Public Information Director James Long told NBCNewYork. "It was a huge fireball," NYC chief fire marshall Robery Byrnes told the Times. "It was in close proximity to decorations, curtains and combustible materials. This type of reckless conduct is not tolerated." Apotheke closed after Trummer's arrest, but reopened Sunday night. Trummer was also released that evening. "My intention was not to hurt anybody," said Trummer in a phone interview with the Times on Sunday night, saying that he respects the Fire Department. "I'm an artist. I'm a mixologist. I'm a cook. But I'm not a pyrotechnic maniac." Fire marshalls visited the Apotheke bar undercover on May 15th after an anonymous tip to the Fire Department, but nothing sparked their interest at that time. The bar received several violations, however, including failure to have an open flame permit. However, "open flame permits really cover candles [or] some type of lantern," clarified Long. Apotheke can apply for an open flame permit, said Long, which would require a followup inspection, but "they're not going to have the green light to do this show. The show itself is very dangerous." The bar, whose name means "apothecary" in German, opened in 2008. Its fire show was featured in a recent episode of "the Real Housewives of New York." The Fire Department became aware of this footage while conducting the investigation into Apotheke. Long cited the Rhode Island Station Nightclub fire of 2003, in which 100 people were killed when a pyrotechnics display accompanying the band caused the soundproof foam around the stage to catch fire. "That's what was being addressed here: an immediate life hazard," he said.